Herilala Randriamahazo for reviewing prior to publication. Some ancestors of the people of Madagascar came from what is now the Indonesian island of Borneo some 1,500 to 2,000 years ago. Soon after, scientists now believe, a wave of immigrants from East Africa mixed with the Indonesians and the population became today’s linguistically and religiously diverse Malagasy people. The African immigrants also introduced the zebu cattle, which have become important to Malagasy economic and spiritual life. Bounded on the west by plateaus and on the east by a mountain range, the Tandroy (“people of the land of thorns”) and the Mahafaly (“those who are happy to be together”) live in a dry climate with unpredictable rainfall and have developed the tenacity and creativity necessary to survive in such a harsh land. Many cultural rituals surround the zebu cattle, which the men herd in addition to goat and sheep. The communities also cultivate maize, manioc, sweet potato and beans. Ombiasas (traditional healers) administer ceremonies for the ancestors and enforce taboos, known as fady, regarding the use of the forests. As the primary means through which life is sustained, both the spiny forests and the zebu cattle are sacred. The spiny forests are also the homes of ancestral spirits and the source of medicinal plants. Madagascar’s many clans have been ruled by powerful kingdoms throughout history until the rise of the modern nation-state. Around the 16th century, kings united villages in the southern part of the island, forming political states and erecting fortifications and moats to guard their territory. By the end of the 19th century, however, the French colonized Madagascar, and ruled the country until independence in 1960. Today, the people believe there are nine types of sacred forests ranging from groves where royal ancestors are buried to areas that uniquely provide particular resources. The Mahafaly guard tombs and burial caves that hold their royal ancestors the Maroseranana in the Sakoantovo forest, and the Tandroy protect traditional medicinal plants and a burial ground in the Vohimasio forest. Traditional taboos on who can enter any type of forest and what can be harvested from the areas have protected these forests from logging and other other destructive forces throughout history. The island of Madagascar is known worldwide as a place of extraordinary biodiversity with a high rate of species found nowhere else in the world. As a whole, 80 to 90 percent of the island’s plant species are endemic, including 1,000 species of orchids, and Madagascar is the only home for lemurs. In the spiny forests, fully 95 percent of the species are endemic. Red sand covers much of the ground, topped by a “scrub layer” of thick bushes three to six meters high, out of which rises desert-adapted succulents (including the Didiereaceae family), cactuses and baobabs up to 10 meters tall that outside observers often describe as “alien-looking.” As the forest transitions to riparian, trees that require more moisture like tamarind start to appear. This dry and delicate climate works for its historically low-density population, but it is being severely tested by an expanding population. Nearly all land that can support rice and other agriculture is already being used, and Madagascar as a whole has lost 80 percent of its original forest cover. Since 1960, the island’s population has doubled while its forest area has shrunk in half. When the population was controlled, the islanders could practice tavy, a system for rotating crop cultivation, followed by natural regrowth, but now the land’s nutrients are being consumed faster than they can regenerate. The island’s northern rain forests have historically been at the top of the conservation community’s agenda. In 2007, the six rainforest parks of Atsinanana were designated a UNESCO World Heritage site, and in 2003 the global conservation group WWF declared the southern forest area a Gift to the Earth. 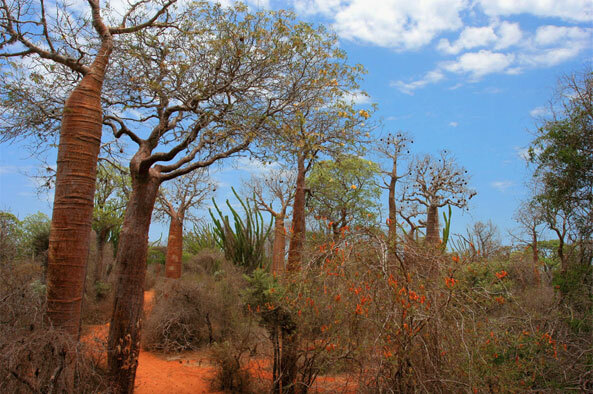 However, the southern area of Madagascar has continued to sustain damage and depletion; even though the population is sparser in the south, the climate is harsher and the people are under more immediate pressure to survive. While the Mahafaly and Tandroy have continued to practice fady, economic circumstances have changed their ability to adhere to its strictures. It is a measure of the people’s desperation that many have started to encroach on sacred forests, clearing them for agriculture and cattle grazing, burning wood for fuel and for sale as charcoal, and hunting species that were previously taboo. Deforestation is on a small scale but widespread—most people are cutting down wood for their own needs and to sell as charcoal. Because of its dry climate, the spiny forest flora grows back more slowly than other habitats. The government of Madagascar, headed by President Marc Ravalomanana, has vowed to make conservation a top priority and use Madagascar’s unique biodiversity to the advantage of the people. However, even when protected areas are declared in poverty-stricken areas, there is rarely the means to enforce protection laws. Meanwhile, on the southeastern coast around the town of Taolagnaro (Fort Dauphin), the international mining giant Rio Tinto plans to open an ilmenite mine by the end of 2008. The mine, which is expected to run for 40 years, will necessitate the destruction of up to nearly four square miles of land on the edge of the spiny-forest ecoregion where it transitions to rain forest. Ilmenite is used to make a titanium dioxide pigment for paint, for which demand increased when lead paint was banned. The mine will be operated by QIT Madagascar Minerals, a subsidiary of Rio Tinto, with a minority 20 percent share in the mine owned by the government of Madagascar and funded by the World Bank. Rio Tinto has promised the mine will bring desperately needed jobs, but activists suspect that many jobs will go to foreigners. The company also says it will replace the sand from which ilmenite is extracted and then replant trees. Currently construction is under way, including mine infrastructure and a harbor. One recent preservation effort came in the form of the transfer of stewardship of the Sakoantovo and Vohimasio spiny forests to the local Mahafaly and Tandroy people, respectively. Local management committees were established in 2003 under a national legal framework for community management known as Gestion Locale Sécurisée and Gestion Contractualisée des Forêts (Local Security Administration and Forest Contracting Administration). The Sakoantovo Forest (nearly 24 square miles) and Vohimasio Forest (about 116 square miles), which after a community management plan is approved will become protected areas, go a long way toward protecting the total of more than 230 square miles of sacred forests in the spiny-forest ecoregion. Madagascar is also a prime candidate for ecotourism, which, if run properly, can give locals an economic stake in preserving their natural resources rather than harvesting them. The World Bank and the WWF have together negotiated a “debt for nature” deal that allows some debt relief, funds for conservation, and strategies for involving local people in park management. Support the WWF’s ecoregion action project in southern Madagascar, which includes community-education projects about the value of conservation and the development of ecotourism. For information about donating money or equipment, volunteering, or ecotourism, e-mail Dr. Herilala Randriamahazo. Crowley, Helen. “Madagascar Spiny Thickets.” World Wildlife Fund. Hotham, Caroline and Christale Robelle Razafindrahova. ‘The Pressures on Madagascar’s Spiny Forest: Patterns in resource use in a transforming environment. A Case Study. An analysis of forest resource use in the Antandroy village of Amboetsy.” Tandroy Conservation Trust, 2001. Rio Tinto. “The Madagascar Mineral Sands Project.” Rio Tinto. Wildlife Conservation Society. “Madagascar.” Wildlife Conservation Society. United Nations Educational, Scientific and Cultural Organization. “Rainforests of the Atsinanana.” UNESCO World Heritage Center.